- as passenger leaves baggage claim, you exit the lot to pick them up at their terminal. Note that it can take up to 30 minutes to exit the plane and retrieve luggage from baggage claim. Don't leave the lot too early. Never leave your vehicle unattended in the Cell Phone Lot or in front of the terminals. Partial days start at $6. When You Park In The AutoPort Terminal Garage or ValuPark Long-Term Lot (a) earn points for free parking; (b) enjoy V.I.P. access in and out. 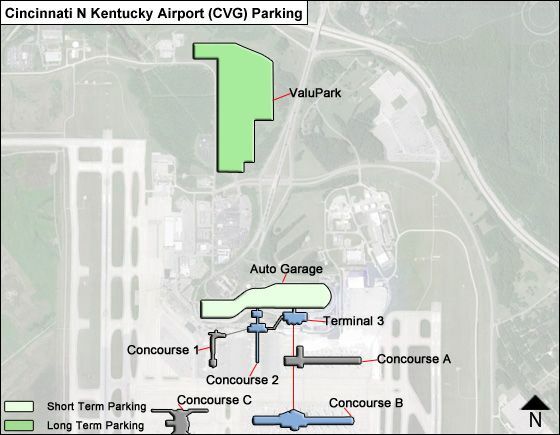 CVG Parking Advantage is the Airport's way of rewarding their loyal on-airport customers. Sign-up is free. No annual fees - no strings attached. Proper amount for tipping shuttle drivers? Do you prepay or pay when you leave?